or individual lines that vaguely echo, in wave-like form, shorelines of European nations in this map from the late fifteenth-century Nuremberg Liber Chronicarum: Das Buch der Croniken und Geschichten, just predating the discovery of the New World. Unlike the on-screen conjuring of a demarcated space, the design of early modern maps invites detailed examination. 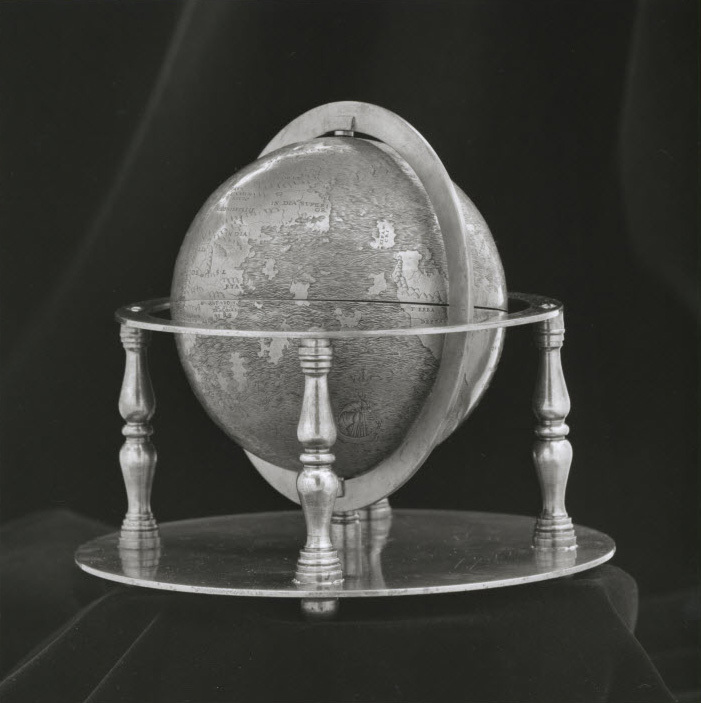 This undated miniature globe, engraved with considerable care on a two conjoined halves of two ostrich eggs, the size of a grapefruit, invites viewers to sail on the seas that swirl around a record global totality as something like a surrogate for actual world travel, its carefully worked details leave a clear trace of the hand, if not a phenomenological experience of keenly recorded sensory properties. The engraving of a newly imagined expanse reported in marine charts created quite distinct operations of visualizing a newly materialized space–it displays one of the first maps to be printed that showed the New World’s form and recalls the earliest printed images of North America. The islands of “Spagnola [Hispaniola]” and “Isabella”, barely balanced with the huge area that it assigns to the Land of Brazil, or “Terra Sanctae Crucis” in something like an antipodal balancing act of continents around the equator, opposed in counterpoint to the Eurasian expanse. If the opposition of these continents in the ostrich-egg globe betrays significant cosmographical learning, the map itself reflects curiosity in the first mapped images of the New World, and a particular care to the definition of the coastlines of the newly found land masses we now call continents. The exquisite care and delicate relief of the globe’s surface in this delicate construction made from two ostrich eggs has been recently dated to 1504 by its shell-density, based on a CT-Scan. If the date can be ever established conclusively, the globe is one of the first images of the New World to have migrated from Portuguese marine charts to a particularly skilled level of craftsmanship, predating some of the known bronze globes of terrestrial expanse it resembles; the image of Europe, Asia, Africa and the Land of Brazil could be scanned in analogously crisp detail to known early sixteenth-century globes and printed map-gores. Indeed, the range of graphic tools engravers developed for embellishing the surface of maps set something of a standard for scanning land and sea, as their exquisite tones of shading increased the persuasive range of graphic forms that the anonymous artisan who made this eggshell map exploited to delineate the inhabited world. The artifice of employing eggshells as a surface of cartographical rendering–indeed, the noble curiosity of ostrich egg shells, an animal recently kept in aristocratic zoos in northern Italy–suggests the precious status that was invested in this curious map as a communication of geographic learning. 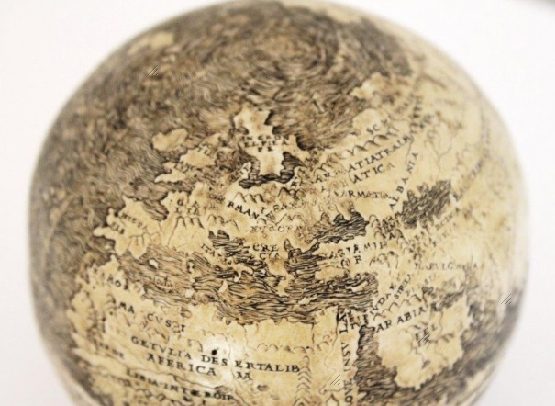 The anonymous artist of the recently discovered egg-shell globe converted the braided lines of oceanic expanse and peaked mountains from engraved maps into material form. But to preserve the sphericity of the globe, the artisans who fashioned the globe joined bisected lower ends of two ostrich egg shells to engrave–unlike the stylized wax-resist used in the Ukrainian art of pysanky, or the common painting of images on ostrich eggs–the surface of the egg that exploited its curved surface and ability to hold fine detail–as in the contemporary artisan Patric Allaert, who specializes in their manual engraving. The ends of the ostrich egg’s shell provided the curved surface of a record of terrestrial unity: if the recent claims to date the eggshell to 1504 are correct, based on the dating of density, the artifact would the first image of the New World is to believed, it suggests the huge investment of artifice in picturing this new-found world. The accuracy of determining the age of the shell by a CT scan of bone-density may well be questioned, given that the loss of 10% per century seems more of an approximation than a device for exact dating. But the egg of an ostrich was of course often valued for its size as a decorative object in elite settings, although the medium seems innovatively used by the creator of the globe in order to create a spherical surface by using only its rounded half to image the spherical earth. Together with the roughly contemporary discovery of a new image of the terraqueous world that derived from the globes of Martin Waldseemüller, the media buzz around the eggshell globe may elide the explosion of material cultures of picturing global expanse that emerged at the start of the 16th century: indeed if Waldsemüller’s twelve-sheet 1507 world map is known in only one example, the newly discovered gores offer the first evidence of their reprinting. Their difference from four sets of printed gores, in all of which its segments are surrounded by a thickly-inked black boundary-line, and unlike them describe the equatorial line, the place of the Malibar coast revised in the gore segments, as the shape of the island of Madagascar, which, together with changes in the shading of oceans and some of lettering, suggest that their engraver made intentional alterations on a new woodblock to attract new readers, as well as to better approximate its cartographical rendering. Chet van Duzer has argued the gores reflect continued experimentation in the format of mapping a legible record of the newly discovered world–and his shifting conception of how the map works to process a spatial information from different sources in a coherent whole–comprehending nautical discoveries in a framework for processing expanse. This set of gores, only discovered bound between two other volumes in the holdings of the University of Munich, suggests that it met a growing demand for the assembly of globes that included the most recent information of nautical charts. The gores were made to be readily affixed to spheres of similar diameter to the eggshell globe–the line distinguishing the “Diameter Globi” reminds us of the material use that this flysheet met, and the flexibility of the medium of a globe in displaying spatial information, and is unlike the four other sheets of gores Waldseemüller designed which are known to have survived. The creation of gores to map the world suggested the popularity and currency of creating a comprehensive global map, however, even in an age of terrestrial projections: if we valorize the Ptolemaic precepts that the ancient astronomer set forth for transferring the curvature of the earth’s inhabited surface to a plane, whose indices guarantee the preservation of uniform scale, distance, and spatial orientation, the embodiment of that space as a globe was as much of a concern for early modern map-users: the “gores” designed by Martin Waldseemüller provide clear evidence, if they rarely survive, of the demand for making such “self-made globes” in the early modern period to visualize terrestrial expanse. Indeed, the Munich gores testify to the popularity of assembling the globe, even in an age associated with the multiplication of alternate versions of terrestrial projections. The eggshell globe responds to similar problems of rendering expanse. Although terrestrial globe were classical forms, the gores present and substantiate a sense of terrestrial globe as a shift in the transmission of mapped information, as revolutionary as that from scroll to codex, that changed not only the experience of ordering a map’s surface but the reading of maps as registers of space–and tactile experience of a map. 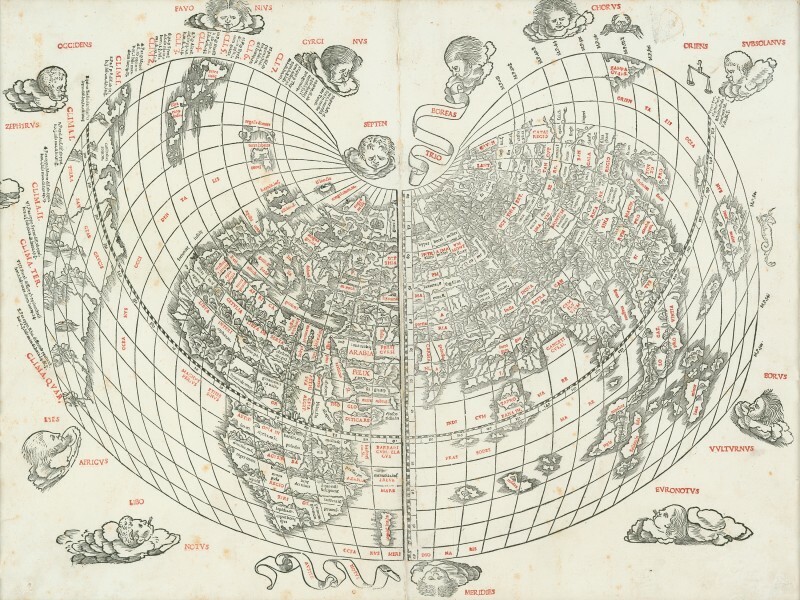 The ordering of the surface of the globe provided a way to communicated the dimensio orbis in relation to both the misura and the pictura represented in maps. 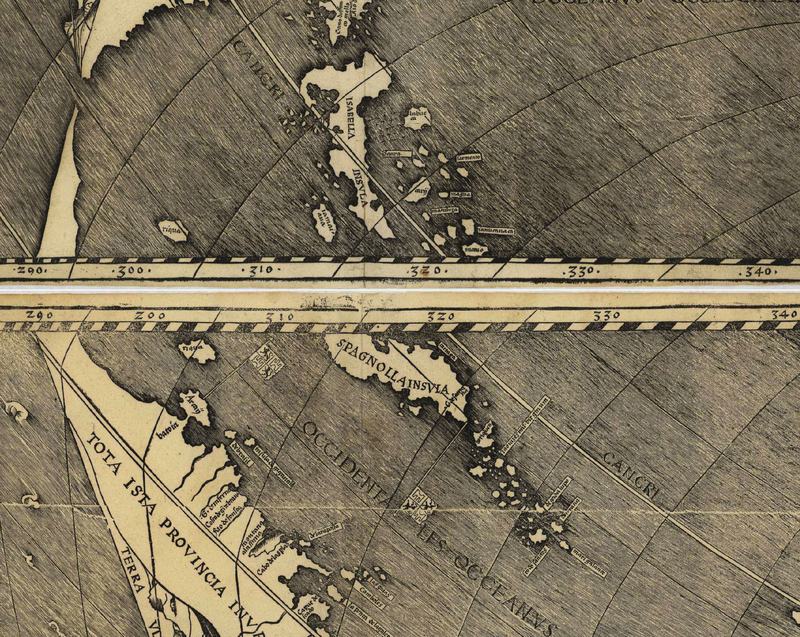 Beyond the suggestion of measuring terrestrial expanse in printed map-gores, the estheticized image of global virtuosically demonstrates its own artifice to its viewers as a record of global continuity on a spherical surface, ingeniously created by joining halves of eggshells at the equatorial line. 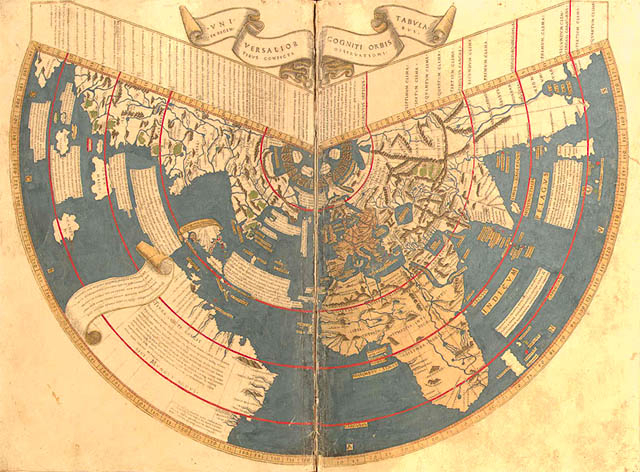 As much as it reflects a humanist culture, the globe is embedded in habits of collecting curiosities like ivory, ostriches or feathers at Renaissance courts that reference the exotic provenance of information mapped on nautical charts that distill an unknown expanse, even as they converted them to a new formal language of scrutiny and examination. 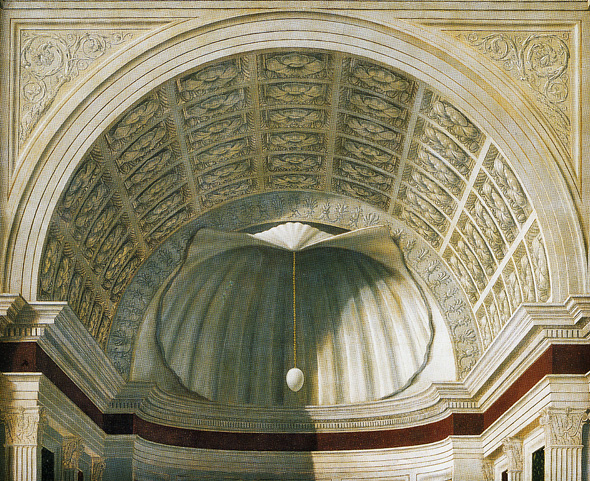 The globe is a miniature, but the size or ostrich eggs were valued as sites of wonder in ecclesiastic settings–ostrich eggs were described as hung in church as mirabilia by Girolamo Cardano, the naturalist Conrad Gesner, and Sebastian Münster, as in this detail from the altarpiece by Piero della Francesca known as the Brera Palla–and were treasured as items gilded in silver, as both natural wonders and curiosities. 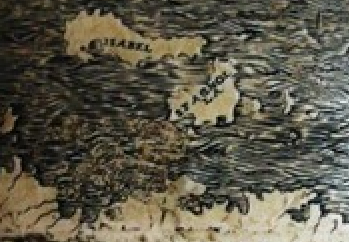 The engraving of the surface of the eggshell appears invested with an expressive quality absent in many contemporary maps. Especially intriguing is the adoption of early techniques that engravers had begun to use to indicate oceanic waves–similar in their delineation of individually cresting waves to the earliest of Ptolemaic world maps– engraved with painstaking care into the shell of the egg, rather than the stippled seas in later engravings, which took an intense patience even greater than the etching of defined coastlines, mountain ranges, and riverine mouths in the elegantly carved eggshells. We do not know who created these lines, but the exquisite care to these bodies of water in the globe invested it with a strikingly concrete presence. 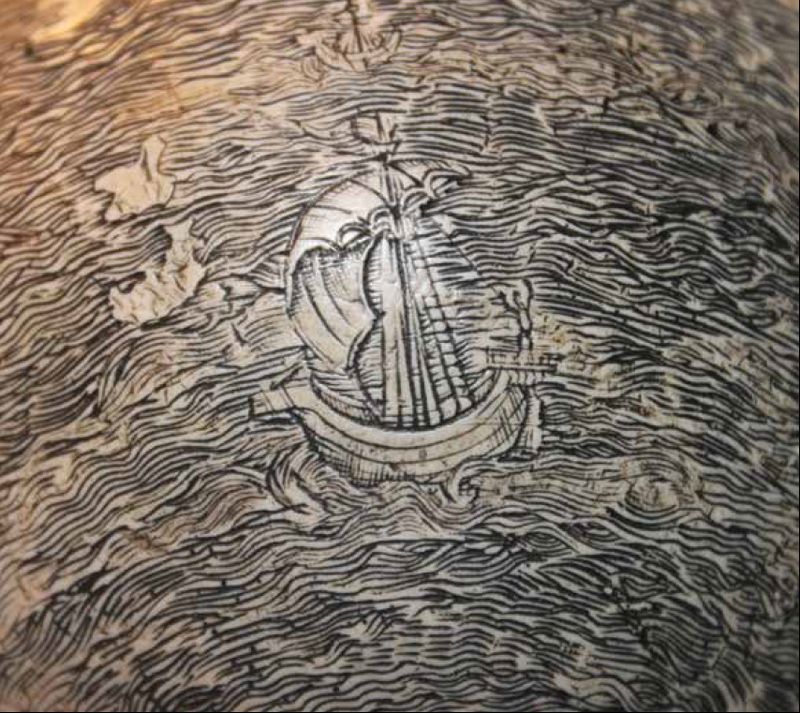 Indeed, the engraving of the sea is distinct from other engraved images, and creates an oceanic surface unlike either nautical charts or terrestrial maps–these cresting rows of dense waves create a remarkable sense of palpability, even if the globe did not distinguish the oceanic expanse by name. 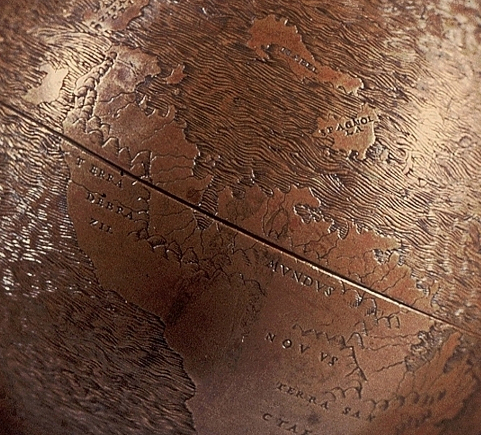 The considerable illusionistic detail reflects the unique provenance of this globe, whose historical details are so far unknown. Ostrich eggs were often collected in late fifteenth-century courts, known either from courtly menageries as much as curiosities of nature, and the precious notion of the surface of this map is reflected in the detailed craft of its engraving. Indeed, the virtuosic removal of calcium carbonate from the shell seems to mediate an early account of the “Mundus Novus” and other regions to a courtly audience; so does the legend, also familiar from other bronze globes, or, near the equator, the legend “H[i]c sunt dracones“–rendered “Here be dragons” by most–in ways that underscored the evocative or linguistically performative nature of the map, as if conjuring newly discovered space for its viewer: the braided nature of the ocean waves lead the viewer’s eyes across the braided waves engraved on its curved surface as if on a voyage across an open nautical expanse with a sense of wonder, and admiration for its artifice. It is difficult to know the degree to which this globe was intended to be consulted as a geographic record. The apparent smudge marks over central Europe and over Brittany in this careful transference of the world map to conjoined halves of two conjoined ostrich eggs’ shells may suggest its display in either city. But the provenance of this unsigned and most unusual of cartographical media is unclear, although its design reflects the popularity of the line-drawn engraved map. The globe elegantly combines landscape with the format of mapped space to lend material solidity to mapped space very rare for the early sixteenth century, destined for an especially sophisticated audience. –and orient viewers by conjoining naturalistic detail and a toponymy written in block lettering echoing humanist type. The record is strikingly different from the sort of symbolic emblem of a world map that Martellus designed in miniature, c. 1490, where Eurasia is surrounded by waters and an almost fanciful ring in which proliferate multi-colored oceanic isles. There is something is far more tactile about the elaborate etching of a world map on the material of ostrich egg shells that foregrounds oceans which link the world’s surface as a surface of travel, which no doubt reflects the impact of engraved images to understand the surface of mapped space: in this delicate curious artifact, painstakingly performed lest the shells (no doubt in limited supply) should crack, would, if the shell’s announced dating to 1504, also make its mapping New World islands of Hispaniola and the Land of Brazil prior to the date traditionally assigned to the first synthesis of Columbus’ discoveries on a printed world-map. While we wait further investigation about its composition and construction, the globe’s intensive preparation from nautical charts might cause one to rethink the role of the map as a legible surface and a decorative form, and the audiences who read maps of the New World in the first age of printing. The clear coastal definition of New World islands and Brazil’s contours and riverine mouths in this most material of maps–about the size of a grapefruit with a diameter of just 4.33 inches (or about 11 cm. )–reveals the transfer of forms of Portuguese nautical charts to the decorative arts, and to a new context of both reading and cartographical artifice. 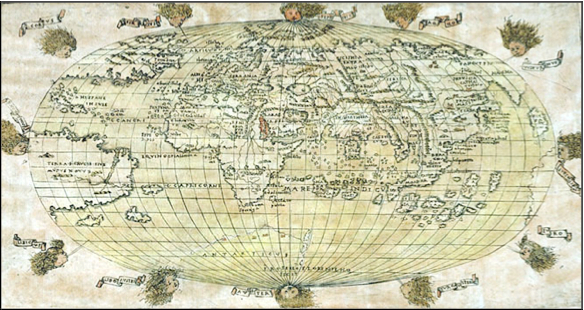 This is evident in the intensive attention to transferring mapping forms to different surfaces attentive to their three-dimensionality in the small globe: if it did not note terrestrial expanse on a Ptolemaic graticule of meridians and parallels, it met clear expectations for a modern form of mapping expanse on tacit rather than explicit indices, noting with considerable craft the continent South America–“Land of Brazil”–from the coasts to its rivers’ paths, after contemporary manuscript nautical charts. But the globemaker converted nautical charts through the labored etching of a landscape map of considerable precision, suggestive of the heightened expectations for exact terrestrial maps. So much is evident from the engraver’s artifice at rendering coastal shorelines and suggestive landscape iconography. The prominent designation “Mundus Novus” on the eggshell globe suggests a slightly earlier date, the very title of the 1503 treatise that Amerigo Vespucci dedicated to Lorenzo Piero de’ Medici, describing “the things most worthy of notice and of being remembered . . . in this new world,” based on his 1501 voyage with Columbus–a letter later Waldseemüller subsequently converted to mapped form. Should Stefaan Missine correctly date the globe, it would be constructed soon after the printing of the treatise describing the voyage to a new continent “more populous . 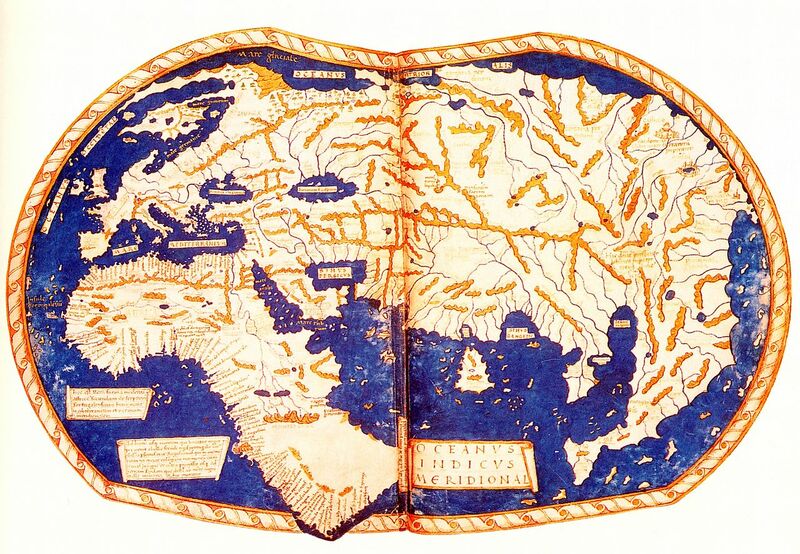 . . than our Europe or Asia or Africa, and even more temperate.” The globe named the region the “Terra Santa Crucis,” to promise the conversion of its inhabitants, in the manner of a Florentine planisphere bearing the date 1507 of Francesco Rosselli–to which I will return. The discovery of the globe raises fascinating questions about its ties to Renaissance cultures of engraving and mapping, as well as to contemporary practices of accurately transferring the surface of the map to a perfectly spherical globe. It also raises questions about its relation to the material cultures of map making. Missinne ventured to tie the globe to the workshop of that Renaissance engineer Leonardo da Vinci, based on suggestive visual evidence as well as the similarities of its detailed rendering of oceans to Leonardo’s drawings of water; despite the lack of interest in details of New World geography in Leonardo’s work, the practice of engraving raises fascinating questions of the migrations of maps to other plastic media. Leonardo was not skilled himself in engraved images, and far preferred manuscript design, he did ask his assistant and heir Melzi reproduce the images for a planned treatise of anatomy with images in copperplate–rather than wood–that reveal some technical familiarity with engraved images, even if he was not known to use these techniques: the cryptic referencing of one comment in his Notebooks reveal an appreciation of its value in a book of artistic anatomy. He ventured in making some nature prints, scholars as Karen Reeds have argued, in ways that evidence deep interest in print as a medium by which to register local detail that could be readily reproduced. Rosselli designed the oval projection that first situated the New World and southern continent for readers in copperplate. The unique oval projection clearly imitated the form of a spherical earth, expanding upon the three formats of projection Ptolemy had described to offer a geometric projection that he accommodated to depict the entire surface of the globe in one bounded image. The projection exploited both the straight parallels of longitude to exploit the legibility of print to prepare New World toponomy and emphasize the continuity of ocean travel to the New World: viewers find the “Terra S. Crucis sive Mundus Novus,” identical to the eggshell globe and Lenox Globe, below the “isole hispane,” in a visualization of the New World closely analogous to that which Vespucci had described. 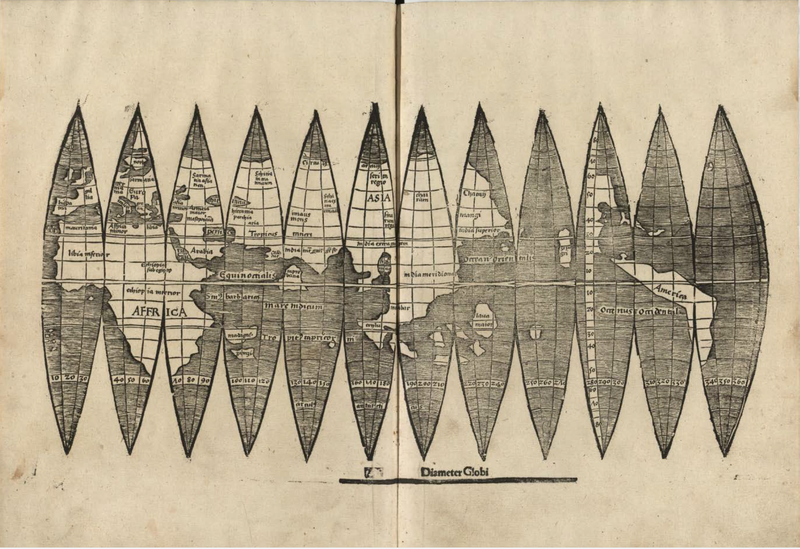 Rosselli’s oval world map resonates with the eggshell map not only in its impressive representation of spherical unity, reflecting in its toponomy and the distribution of islands the content of the eggshell globe; in much the same manner, the globe mirrors attention to the detail of single-line engraving and clearly delineated humanistic capital letters. Rosselli’s application to engraved maps, now believed both substantial and sustained, the elegance of Rosselli’s carefully engraved elegant woodcut lines and experimentation with copperplate engraving make him a more likely candidate than Leonardo to have experimented with the spherical eggshell globe, and indeed in imagining the representation of terrestrial continuity as a surface that viewers could scan with equal attention to its details, much as he seems to have constructed multi-sheet images of cities, much as the detailed image of Florence above allowed viewers to linger over its best-known buildings–if this “Chain View” was constructed after Rosselli’s multi-sheet map, it preserves its conceit of comprehending the city in its totality. 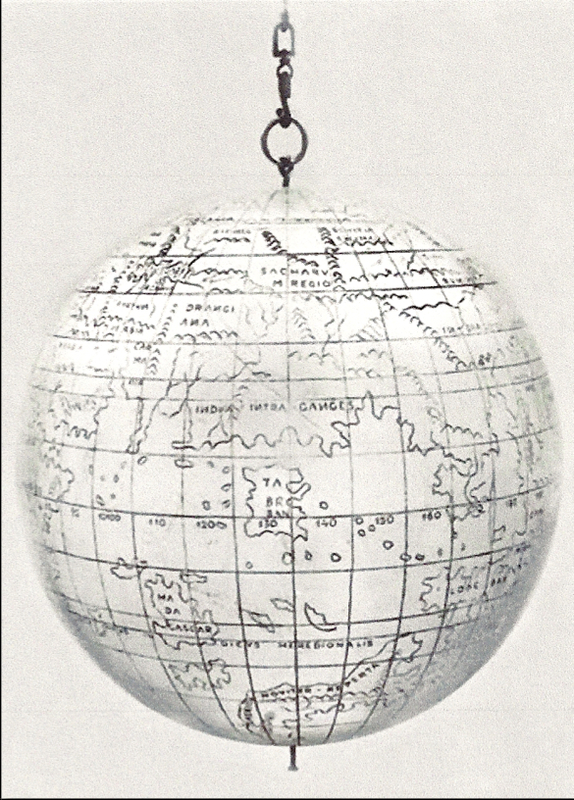 The global view, as if of an “exploded” globe, uses an oval projection of his own devise to show the word’s surface as it lay upon a globe, to illustrate the relation of the New World islands that Vespucci had described across the Atlantic ocean and did so in ways that inexplicably magnified the possibility of Portuguese territory in the New World that had been earlier adjudicated at the 1494 Treaty of Tordesillas, which granted Portugal sovereignty of lands within a meridian that was effectively drawn 370 leagues west of the Cape Verde islands, already within Portuguese sovereignty. The Florentine master-engraver dedicated himself to mapmaking after Ptolemaic criteria so heavily to make his relation to the eggshell globe more plausible: Rosselli’s mastery of single-line engraving, the close resemblance of mountains engraved on the globe and Rosselli’s inclusion of mountainous topography, and his use of dedication to elevating the status of engraving through sustained involvement in the design of maps–evident in both the oval projection and an illuminated version that derived from an imprint of the very same engraving block. Indeed, his experimentation with the dramatic coloration of the map reveal a blending of naturalism and cartography that is analogous to the eggshell globe. 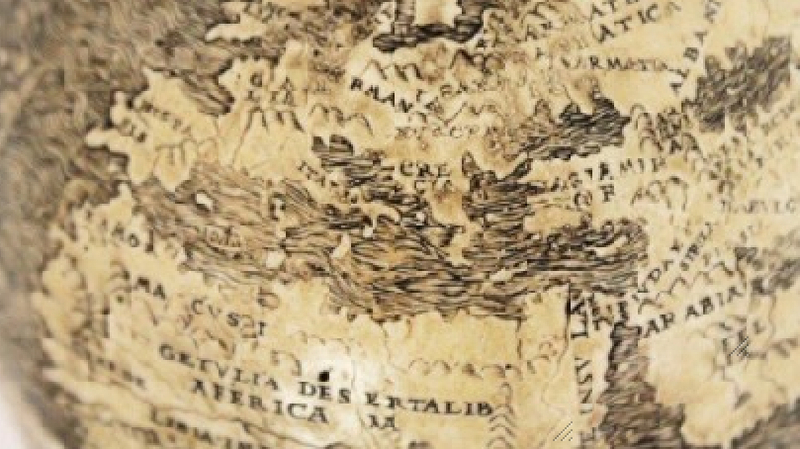 The detailed rendering of the eggshell-globe reflects the increased interest of preparing maps as forms of graphic evidence and persuasion in a surface readily scanned. The globe is a far less fulsome statement of cartographical expertise than the wall-map of Martin Waldseemüller, whose twelve sheets printed on rag cloth paper survive in few examples save the one discovered in recalls the intensively detailed workmanship early globes that must be examined in relation to the spherical representation of spatial continuity on the eggshell globe, and the extent to which the eggshell globe may have served as a model for other early globes–all, curiously, made for globes of about a three-inch diameter, or one and a half palmi. The close attention to naturalistic design of the ocean’s face and use of block capitals of Bembo lettering to note toponyms links Rosselli’s oval projection and the eggshell globe and its apparent cast, the Lenox Globe. 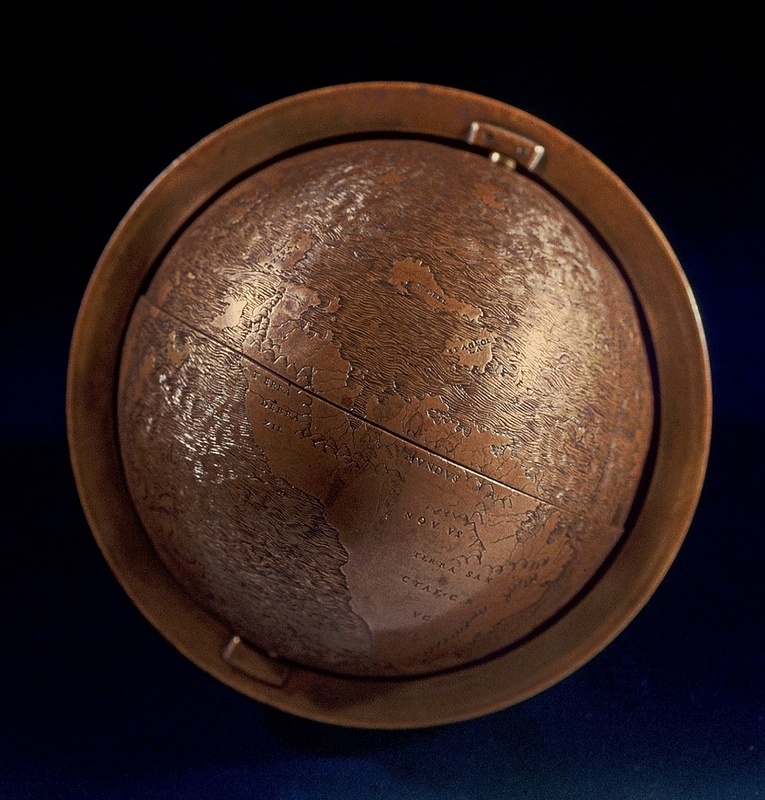 The hollow copper Lenox Globe of a diameter of 4.4 inches (11.2 cm. ), identical to the eggshell globe, foregrounded the novelty of importing information from nautical charts in ways that parallel the novelty of the eggshell globe: the oddity in that globe of naming most of Asia as “India”–and locating “Mundus Novus” as South America–suggest a cartographical confusion of transmission as much as laxity, and a confusion in naming: it similarly noted “Libya Interoir [sic].” The surface of this curiosity, discovered in a Parisian antique shop in the mid-nineteenth century and kept as a toy for several years, also uses a humanistic script to note places and regions and a landscape iconography–similar to the most elegant Ptolemaic codices. The apparently identical showcasing of the newly discovered islands on the Lenox and eggshell globe clearly link them to the design of an identical cartographer, eager to press a striking argument of terraqueous continuity to an interested audience. Such globes are both of impressive craftsmanship, ordered on clear parallels and meridians. The so-called Jagiellonian Globe engraved in metal is of smaller diameter than the Lenox Globe, its diameter just 7.35 cm. Its exacting craftsmanship mirrors and seems informed by the rendering of the New World on twelve engraved sectioned “gores” that have been credited to the French geometrician Louis Boulengier of Alby, circa 1516–the gores, which some argued were only placed in Waldseemüller’s treatise of cosmography, and came to be regarded as part of his treatise, processed cartographical knowledge of a New World, which offered the ability to comprehend a similar offered a slimmer image of South America for ready consultation, with a considerably clearer toponymy than the Lenox Globe or the ostrich egg-globe that may well be the model from which it seems to have been cast–as is certainly suggested by their identical features. The five surviving sheets of gores that survive as independent flysheets–below first in a modern reconstruction and then a recently discovered individual sheet of twelve sections–are rare, but suggest an early market for globes as symbolic forms to organize and process space–if not models for crafting miniatures like the Lenox and Jagiellonian globes. 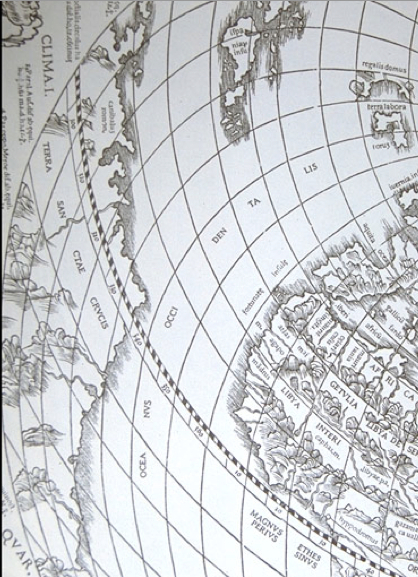 The decorative globes suggests broad familiarity with forms of publishing maps, and an interest in creating a material image of measured expanse. Their similarities also suggest the potential role of the eggshell globe–or a lost prototype which might be its model–in the transmission of information about the New World. Although the eggshell globe is claimed by Dr. Missinne to have been produced near Florence, and dated with somewhat astounding accuracy to c. 1505, when a number of world maps based on nautical charts circulated in the city, the eggshell globe may indeed suggest that a far broader circulation of geographic images occurred than what has survived–and indeed that the globes displayed a comparable claims to accuracy to the famous Lenox Globe, previously dated only with a quite approximate estimate. Particularly striking is that neither globe makes note of the equatorial line–a crucial concept in cosmographical learning–although the form of the globe clearly gestures to it–and neither map notes the Treaty of Tordesillas. 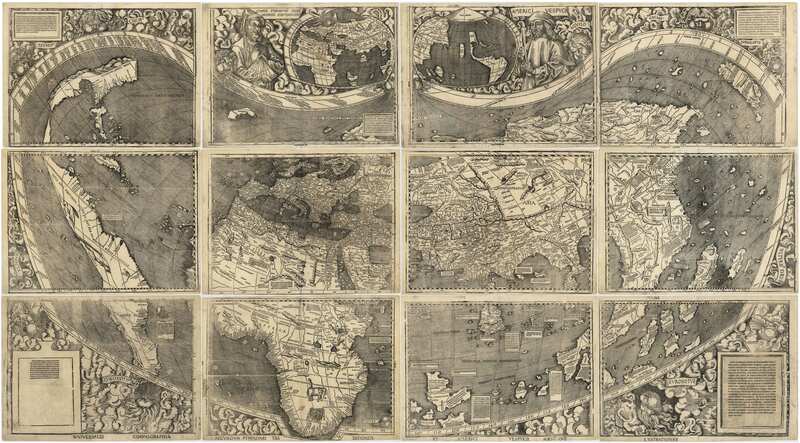 Each of these globes attest to deep curiosity in scanning the surface of the map as a power over space, and a transferring of maps on a globe, predating Waldseemüller’s placement of “America” as a separate and distinct continent in his majestic twelve-sheet wall map of 1507, whose measured indices set a new standard for the functions of a map’s face and design as well as its cosmographical argument for terrestrial continuity. The first two copper globes have been tied to a tradition of world-mapping that is more ornamental than humanistic, but responded to a similar elevation of the artifice of mapping as a basis for transcribing terrestrial unity. The engraved toponymy of the spherical conjoined shells in fat suggests a complex translation of nautical charts and cartographical forms into ‘new media’ of powerful symbolic roles as dense compilations of geographic information, probably for an audience distinct from the detail of the larger wall-map. 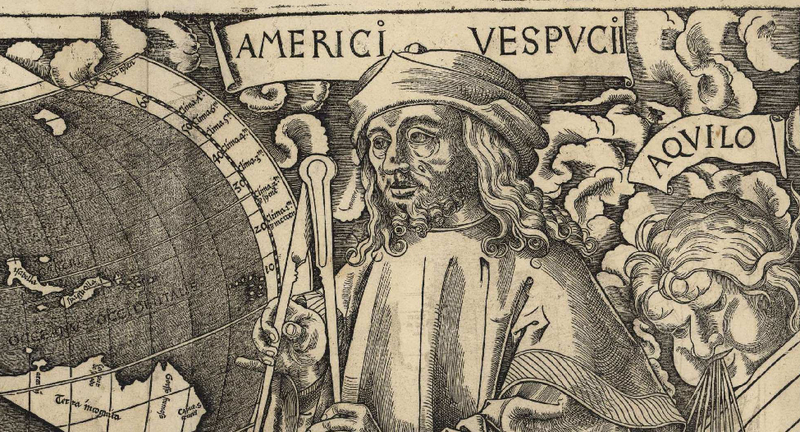 Waldseemüller is often credited for synthesizing a Ptolemaic model to measure the global distances and Columbus’ practice of mapping Portugal’s relation to the New World, fashioning a solution between the calculation of terrestrial expanse. If these two miniature globes accommodate the form of Brazil, the ostrich-egg globe suggests that the interest in such maps had migrated to courtly audience with a detail far beyond the twelve-sheet projection of the sort included in Waldseemüller’s treatise. But more than responding to the sort of cartographical expertise that Waldsemüller communicated, the eggshell map seemed to orient viewers not only by its sphericity, but the clear legibility of its toponomy–whose clear legibility provide viewer with the most prominent orientating signs. 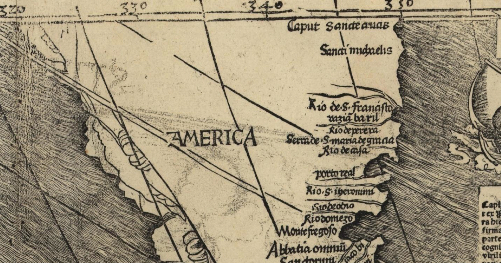 Although the cartographical location of “America” is occupied by two isolated islands of “Spagnola” on the ostrich-egg globe, but the discovery most delicate of globes was created at the same time as the first engraved maps of the New World’s novelty and predating most other known printed wall-maps, long studied as offering the first images of America. The set of twelve gores, if unsigned, are regularly read as part of the learned geographer’s “Universalis cosmographie descriptio” of 1507–whose one note of plain celebration was printed on the reverse of the fold-out gores read as part of the book where he described a new world, “surrounded on all sides by ocean;” on the verso of the fold-out gores that were included in the booklet, he told readers modestly that “the purpose of this little books is to write a sort of introduction to the whole world which we have depicted on a globe and on a flat surface. The Globe I have limited in size, but the map is larger.” But the eggshell globe seems to show an interest both in the artifice of creating a record of nature–witnessed in the detail dedicated to the rendering of oceanic expanse–and the legibility of expanse. How did the eggshell globe relate to a broader material culture of globe-making, or the gores themselves? Further examination of the globe may reveal whether the meridian drawn at the Treaty of Tordesillas to divide Spanish and Portuguese possessions in the New World and separates the “Terra di Brazil” was an intended construction. But the viewer is primarily oriented by the globe-maker’s adoption of Vespucci’s exact toponyms. 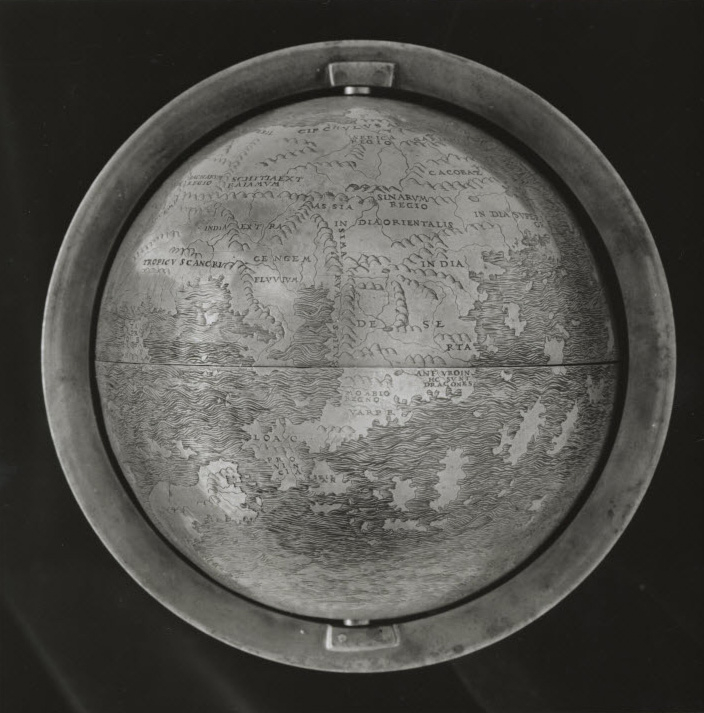 Though not following a self-consciously Ptolemaic form, the Lenox globe vaunts its own modernity, noting “Spagnolla” and “Mundus novus” (Land of Brazil) in places identical to the eggshell globe offer some testimony of the novelty modern tools provided craftsmen as a means to process relations of terrestrial expanse among informed viewers that were invested with recognized epistemological claims–if not a common ancestor map. 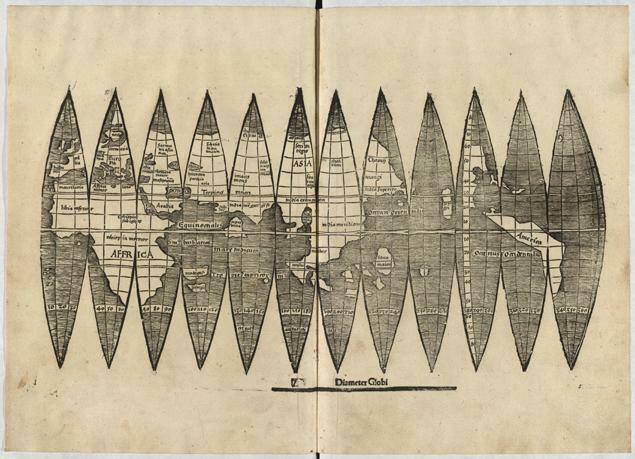 Even while not measuring global expanse on a grid of parallels or meridians, the eggshell globe showcased the novelty of recent Columban discoveries. The rare number of such maps that have been found have an iconic status and laconic texts makes any discovery of a new cartographical rendering of the New World an occasion for comment–in large part because they can only make us wonder what sort of meaning they had for their readers, and how much they confronted problems of noting the circumference or size of the terrestrial globe or of reconciling ancient authorities with the Columban discoveries. To be sure, the medium of engraving this newly mapped space seems in its very presence communicates the value that early geographical maps had for their readers and audiences as subjects of discussion. For the prominent place that they give to an image of exotic lands that were known as they were described in travel accounts as that of Marco Polo or the Franciscan William of Rubruck, from Arabia to Japan to Africa, suggest little concern for drawing boundary lines or positions of cities so much as vague regions of provenance–as the appearance on this globe of the inscription in its perhaps earliest form in Eastern Inda, Hc svnt dracones, “Here lie dragons”–the legend cast in the copper Lenox Globe, previously dated c. 1510, and the slightly smaller gilded so-called Jagiellonian Globe thought to be of the same era–a phrase now retained as motto of Wired’s MapLab. 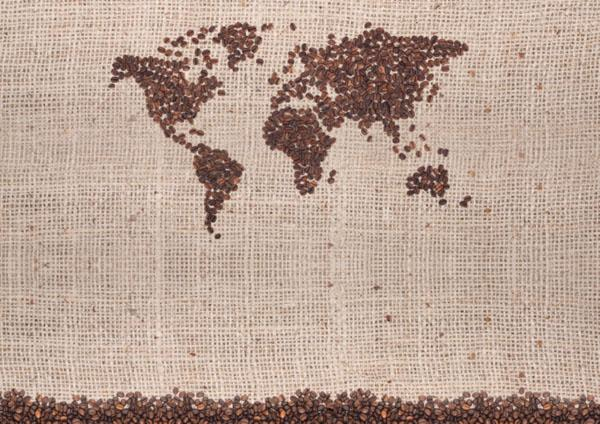 The phrase has been taken to evoke the persuasive powers of maps to define a region, and indeed to serve as a surface to mark the boundaries of one’s work. The phrase was long taken as tacit acknowledgement of unexplored or particularly dangerous territories, and as an evocative inscription seems to derive from the 1879 “discovery” of the Lenox globe. Even if ancient authorities from Pliny the Elder and Solinus note “snakes” in the southern regions of Africa, and the Roman “Peutinger Map” notes the sites of the birth of scorpions, elephants, and dog-headed peoples (cenocephalous beings), these regions were noted with rarity on the surface of maps. Even as these maps expressed considerable curiosity about the borders of the inhabited known world, reminding viewers “in his locis elephanti nascuntur“, “in his locis scorpiones nascuntur” and “in his locis cenocephali nascuntur“–the c. 1300 Erbsdorf map even noted a “dragon [draco]” in south-east Africa–the “Here be Dragons” formulation suggests a far more fanciful description of space than the Lenox or eggshell globe must have carried when they were made. Indeed, the “dracones” have been linked in other globes to the cannibals in the Kingdom of Dagroians that Marco Polo described. It has long been noted that the spherical hollow globe whose diameter is 11.2 cm. (4.4 inches) reveals little influence of Walseemüller’s 1507 world map that first named America as a separate region, but prominently noted islands discovered in Columbus’ second voyage–described by Vespucci–and a “Terra di Brazil.” (The armature in which it appears was used to display it within the New York Public Library, but the globe was not earlier associated with it.) 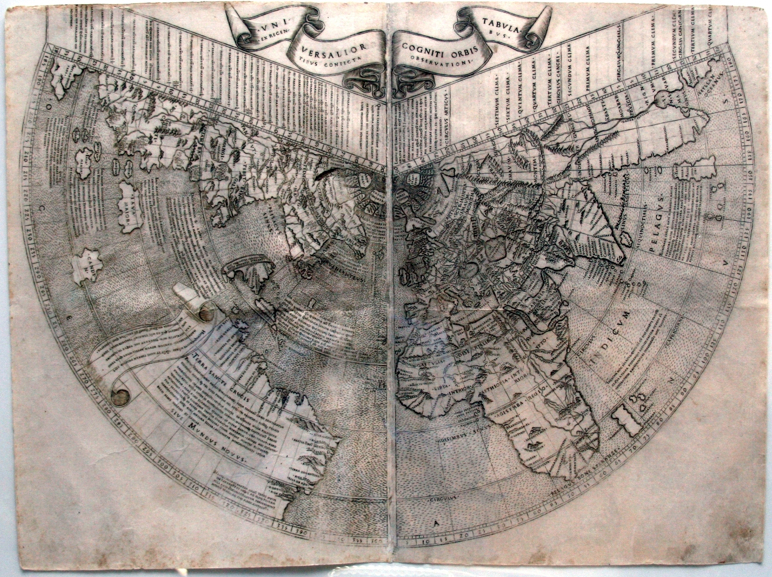 Dr. Missinne dated the conjoined shells of ostrich eggs to 1504 based on their relative integrity; although the precision of dating the integrity of an eggshell raises eyebrows, the proposed date would make the globe the earliest to situated New World islands on a map, if not a model for the multiple globes–and gores–of similar dimensions. If not a sister-globe to the copper Lenox globe, which may well have been cast from it, the eggshell globe may constitute an original version of a Globe long believed the first ever made: if so, its historical significance demands investigation, with special attention to the inventive properties it assumed as a quite plastic communication of detailed geographical knowledge. 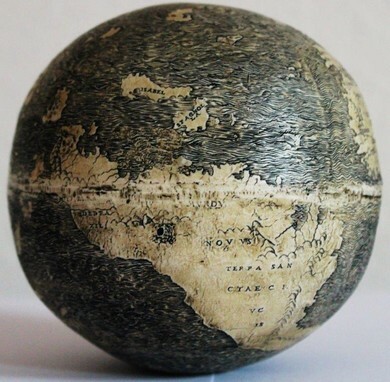 The ostrich-egg-globe provided a material rendering of the inhabited world that gave considerable concreteness to its more exotic regions, lending each region a solidity detailed with landscape views. Notwithstanding limited accuracy of measurement in the carefully etched shorelines, it has a wonderful solidity and materiality about the engraved surface of the egg-shell globe in such compelling detail, which suggest a deep investment in the legibility of the globe’s expanse. The humanistic capital letters engraved with exactitude upon the surface of two halves of ostrich egg shells, cut and rejoined along the equatorial line: much as the copper halves of the Lenox globe are two conjoined hemispheres, tied together by a string from each pole, the spherical globe emphasized the equatorial line as a basis to assemble its etched surface, but showed a wonderfully detached “Hispaniola,” lightly floating northwards of a bulky Brazil. (It’s interesting that Missinne attempted to tie the globe to Leonardo da Vinci’s school–if not to his person–although from what we know of his life, Leonardo never engraved, though he requested his assistant prepare engraved images of the human body’s anatomy in copperplate, rather than wood, revealing his familiarity with the medium.) The globe fits within a known cartographical tradition that was perhaps accessible to Leonardo–indeed, the majority cartographical models available in early sixteenth century Europe were diffused by engravings, either in wood or, more rarely at this point, copperplate. Although the image of the Americas is but a set of islands above the vast expanse of the ‘other continent’ to the south, the detailed shoreline and vaguely mountainous interior of the modern South American emphasize a clear sense of materiality as much as foreignness–much as the possession of the globe seems intentionally designed to communicate. Unlike the large wall maps that distill similar cartographical sources, the sense of expanse is not abstracted, but has a solidity, even on the airy eggshell surface, as a commodity and an object of treasure that would be at home in a cabinet of curiosity; the globe included Japan, Latin America. Brazil and Arabia, as if to note the provenance of other wonders, as much as to communicate the accurate measurement of a global expanse. The assemblage of global space is unlike the stippled ocean of the 1507 Ptolemaic world map or the indication of shorelines in the 1511 Venetian world map of Sylvanus, both of which suggested the curvature of the world in engravings that clearly referenced the rendering of expanse on a spherical globe’s surface, as well as a Ptolemaic format of map-projection. The Venetian edition of Sylvanus magnified Brazil’s coastline disproportionate to the islands of Hispaniola, exaggerating its dependence on nautical charts, to suggests a material entirety and completeness, an influential attempt to expand the place of the Americas in the surface of the inhabited world, using Portuguese charts that noted Africa’s circumnavigation; the world map of the cartographer and illuminator Johannes Ruysch, may draw from voyages on English ships, and map Newfoundland in relation to the New World. In each of these individual instances, the Ptolemaic format of projection emphasizes its rendering of nautical expanse in this hand-colored copy of a two-page terrestrial projection, and gave far more accuracy to the coastlines of Africa and South America, which its publisher praised as “painstaking . . . in delineating the globe[‘s surface]” and skilled for its artifice, suggesting not only the mechanical construction of the planisphere but its knowledge of the proportional relations among its regions and parts, and relations between its meridianal zones, or tropics, and Ptolemaic indices of terrestrial projection, that situated the image within a strongly lettered tradition. The ostrich-egg globe especially contrasts to the triumphalism of his wall-map of four by eight feet, or the reduction of the expanse of the inhabited world in the gores Waldsemüller first designed in 1507, just after the proposed date of the ostrich-globe, as graphic forms to assemble rudimentary globes of meridians and parallels, and which were reprinted in a second edition, viewable below. The ostrich-egg globe is distinct from these theoretical tools, or the more expansive and triumphal mapping of the world that included the image of Amerigo Vespucci, assigning the name “America” to that continent, and naming it, above “Spagnolla insula,” as a fourth continent, in ways no doubt tied to the eggshell globe. 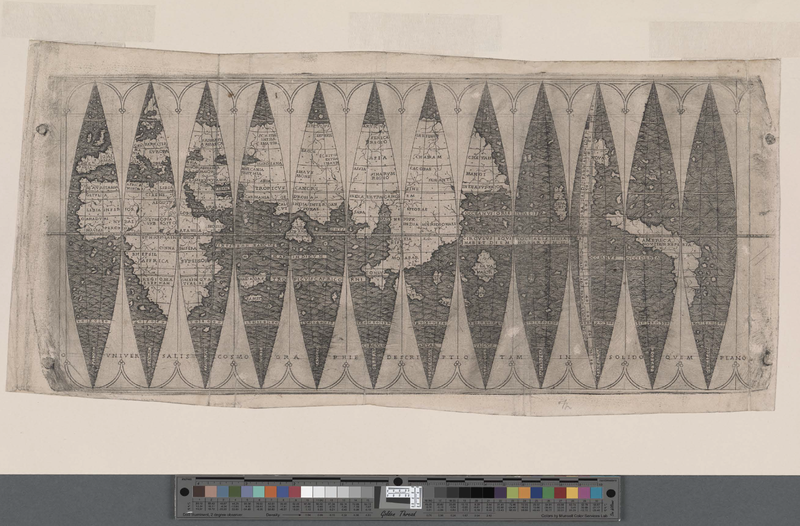 The artists or engravers who designed the ‘gores’ to assemble such globes are unknown; so are those responsible for the expansive twelve-sheet wall map Waldseemüller helped draft for his humanist patron Matthias Ringmann. But their craft reveal an intellectual scope to picture the new continent for viewers whose relations could be readily judged by informed viewers. The visual arrangment of the contours of continents more earthy and less abstract view of space etched in the ostrich-egg globe. While without indices to determine spatial relations, it derives from a flurry of experimentation to capture in different media the curiosity of the New World for socially elevated audiences outside those who might speculate on the relations between the expanse of the globe Ptolemy had described from a description of global expanse–and who demanded expertise in a Ptolemaic ‘art’ to render expanse. 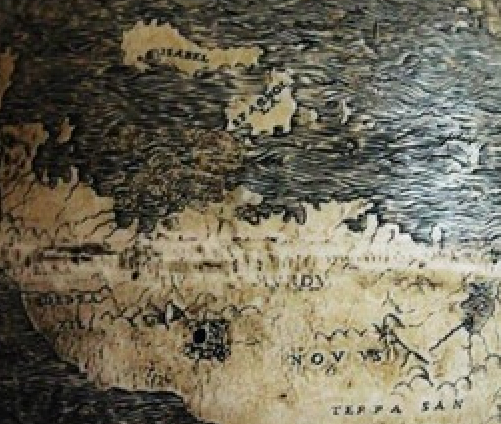 The placement of its landmasses on an etched suggests a far less prominent or conspicuous announcement of a new continent, to be sure, than a surface removed by sea, and a translation of geographic language into a register of wonders. The ostrich-egg globe, lastly, suggests the need to identify the variety of compelling contexts to read maps as curiosities as well as indexed documents, ordering geographic space for new audiences by practices transmitted across networks of collaboration–rather than as idealized geometric forms. It is interesting to examine why Ptolemaic artifice is less on display in either of the globes, also made from marine charts. Identical in most aspects to the Hunt-Lennox globe in the New York Public Library, which was made of conjoined halves of copper connected by a thread at its poles, the eggshell globe poses questions about the artifice by which it mediated the coherence of terrestrial expanse to different audiences of readers–oriented them to a totality of terrestrial expanse they could never hope to know at first hand, clearly privileging its ordered nature but not reducing it to indices. The tacit ordering of its surface suggests the elite audience that its anonymous designer addressed. The smaller globes discussed above experimented with forms of representing expanse on maps to find solutions for translating expanse to communities of viewers tacitly familiar with forms of ordering space within a map, but with little interest in registering or designating location on coordinates. Waldseemüller participated in a broader learned culture that converted maps of nautical derivation, such as the world-map of Henricus Martellus, to forms that had status within a humanist tradition of classical learning. 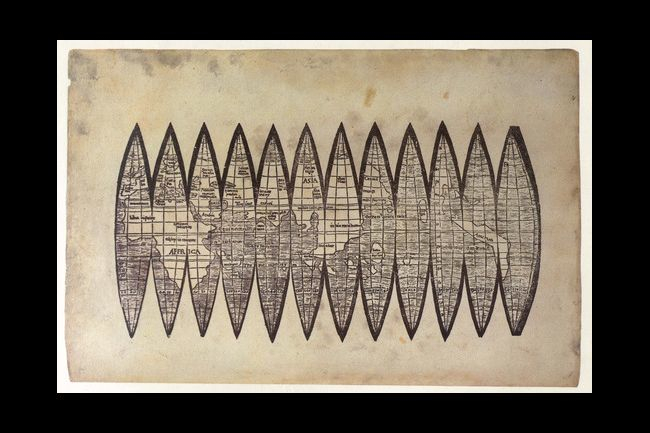 His engraving let authority to the spaciousness of world maps as containers able to hold a copious range of information that they were able to condense, conveying a record of the immensity of global expanse in a single, continuous, synthetic form. The elegant engraving of the shell of an ostrich egg reveals a huge investment in crafting a surface whose contents could be readily scanned, echoing the unique planispheres that Rosselli elegantly produced, and perhaps revealing the major role that Rosselli’s work played in its production.